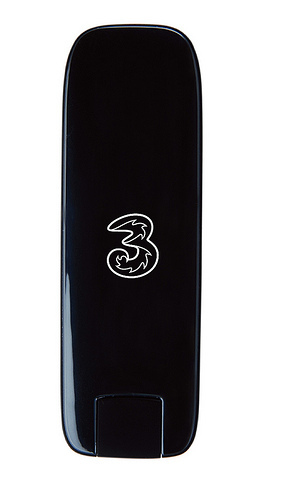 Last month Three UK launched a new "Premium" mobile broadband dongle. The dongle (pictured on the left) is the Huawei E367, and they say it offers improved performance, plus it offers up to 40% faster browsing, even before HSPA+ is enabled. I am yet to have a play with the new device, (Three people, nudge nudge), but over at the wirelessworker.net, Ben Smith has had an initial play with the modem, you can head over there to read his initial thoughts. This new model of dongle is the first from Three to feature the latest technologies such as HSPA+. Personally I have always preferred the mifi to dongles because of the way the dongle sticks out of your machine. I am always worried about them being knocked or damaged in some way, or losing the cap like I seem to do with USB sticks. However with this new dongle, a nice feature is that is has a rotating head, plus the USB connector tucks into the dongle and swivels out when you need to use it. This way you will not be able to lose the cap and now it can rotate it can go vertical so it will not poke out from your machine as much as before. Three’s Huawei E367 Dongle is available on PAYG 1GB Ready To Go for £69.99, or on a rolling one month contract for £49.99 upfront and £15.99 per month for 5GB, or with no upfront charge and 15GB for £18.03 per month on a 24 month contract. Existing customers can also upgrade their current dongles for £59.99. I am always interested in feedback so feel free to add any comments, or you can mail me here.